In 1912, over the course of 11 months, the Anderson Memorial Bridge was built over the Charles River in Boston, connecting Boston with Harvard Square. 100 years later, in 2012, the government decided to repair the bridge. Those repairs have so far taken four and a half years and cost $26.5 million at last count, and that is not a final tally, they are still working on the bridge. In other words, repairing this 232 foot long bridge has taken at least five times as long as building it in the first place, and while I couldn’t find the original cost, I’m confident it’s also costing more as well (even if you adjust for inflation). This is not an isolated example. You don’t even have to leave the city of Boston to encounter another legendary example of cost and time overruns, the Big Dig, which took twice as long and was three times as expensive as originally planned. Is Boston just bad at infrastructure, or is this a problem the entire nation is grappling with? There’s certainly reason to to believe that it’s a nationwide problem, not just something unique to New England. On top of that there’s evidence that our infrastructure costs much more than similar infrastructure in similar countries. But I’m jumping ahead, there is actually another question we should be asking first. You may be wondering what that question is. But more likely you’re wondering why we’re talking about infrastructure at all. Well, sometimes we have to put on our big boy pants and talk about stuff that, while mundane, is actually super important. We can’t spend every blog post talking about cool stuff like nuclear apocalypse, or artificial intelligence. Sometimes we have to look at the boring stuff. Though I’ll do what I can to make it less boring. But back to the questions. Before we ask whether we’re any good at building infrastructure these days, we should be asking how bad our current infrastructure is. If our current infrastructure is fine, and we don’t need to build much in the way of new infrastructure, and the need for repair is infrequent, then it may not matter how good we are at building and repairing infrastructure. But of course this is a trick question. All right thinking people believe that our infrastructure is horrible and we should spend lots of money on it. In fact, despite not agreeing on nearly anything else, both Trump and Clinton (not to mention Sanders and Rubio) had plans to rehabilitate the American infrastructure. Of course Trump won, so whatever infrastructure improvements that actually happen will be carried out along the Trump model, which has some interesting quirks, but before we get into that, it might be useful to look at how bad the infrastructure really is. One of the most commonly cited measurements for the quality of our infrastructure is the Infrastructure Report Card issued by the American Society of Civil Engineers. For some reason the last report is for 2013, but in it the US got a D+. This sounds pretty bad, though to be fair that’s up from the last report which gave the US a D. There’s also the question of what that D+ really means, if it gets down to an F does the country’s infrastructure spontaneously collapse into rubble and dust? I hope not. The story of how the infrastructure got to this point is one of those fascinating tales where a lot of factors ended up working in combination. I can’t possible cover all the factors, but there are a few that I find particularly interesting. It’s not hard to imagine how constantly putting off or lowering the priority of maintenance could lead to poor infrastructure, but it’s also useful to place it into the larger category of things which increase fragility. Fragility being a major interest of this blog. As I have already pointed out in previous posts, fragility comes from taking small, limited profits. In this case the savings you realize from forgoing annual maintenance. The problem is that forgoing or shortchanging annual maintenance, creates the risk that you’re going to end up with a large unbounded loss. In this case a bridge collapse. Further complicating things, maintenance does not have a large built in political base pushing for more spending. Of course that all changes when something catastrophic actually happens. At that point there will be a huge outcry, but it will be too late. The damage has already been done, and most of the people responsible for shortchanging maintenance will have already retired. Another thing to consider is the fact that most infrastructure is hidden. When you say the word infrastructure, most people think of roads, but that’s only one of the 16 categories the American Society of Civil Engineers tracks. The other 15 categories consist of areas like ports, levees and dams which the average person has very little opportunity to stress test on a day to day basis, unlike roads. One category which is a particularly good example of this is water. We all expect water to come out when we turn the tap, but some water mains are over 100 years old, and I’m sure we all know someone who has a story of a water main breaking at the worst possible time, for example on Thanksgiving. (I know someone who claims this has happened to him twice.) But even in a situation like that, most people are too busy cursing to think about governmental underinvestment in infrastructure. It takes something like the crisis in Flint Michigan to make people realize how bad the problem is. I’m sure you’re familiar with the story of Flint, but to briefly review, Flint switched its water supply, and in the process failed to realize the need to add corrosion inhibitors to the new supply. Without that lead leached into the water leading to the exposure of thousands of people (at least 6000 of them children) to extremely elevated levels of lead. It may have also lead to an outbreak of Legionnaires’ disease which killed 10 people. In other words it was bad, and there’s plenty of blame to go around, but for our purposes I want to draw attention to the role played in the disaster by 100 year old lead pipes. No lead pipes, no lead exposure. Flint had 100 years to fix this problem and they didn’t. But of course this is a problem that no one fixes. It is not unique to Flint. In fact there are vast numbers of 100 year old lead water mains spread out all over the country. Of course it’s not just water mains that are old, lots of our infrastructure is showing it’s age. The real infrastructure boom in the US was after World War II, which means that many of the bridges and roads and schools and power lines were built 50-60 years ago. Of course just because something was built 50-60 years ago doesn’t mean anything by itself. To take an extreme example the Pyramids were built 4500 years ago and they’re still standing. But this is where we come across one of the more fascinating stories in this whole saga. The story of reinforced concrete. It’s an interesting sidenote to the entire infrastructure crisis. And if you’ll forgive me this slight diversion, I think it’s worth delving into. Concrete, by itself, holds up pretty well, the Roman Pantheon is made out of concrete and it’s still around after 1,900 years, so why should we be having problems with our current reinforced concrete after only 50 or 60? Well, perhaps ironically, it’s the reinforcement that’s the problem. Reinforced concrete is reinforced by steel. Steel is mostly iron. Iron rusts. Thus you have a situation where buried in every reinforced concrete structure is a slowly ticking time bomb. And it can blow up in a couple of different ways. It’s easy to see how a structure designed around new steel will bear less weight once some of that steel has been eaten away by rust. But the rust also causes the reinforcement to expand (by up to four times) which breaks away concrete, weakening the structure and letting in more water. Yet another hidden weakness in our infrastructure, and one that’s particularly hard to repair. You may be getting a pretty good sense of why the American Society of Civil Engineers gave the country a D+ on infrastructure, but beyond saying things are bad it’s hard to know what to do with a D+ grade, obviously it’s subjective to a certain extent. Fortunately in addition to the letter grade they provided a dollar figure which is hopefully more concrete (get it? Concrete… Infrastructure?). 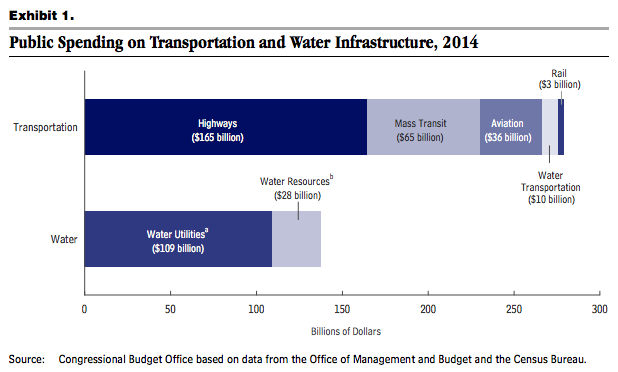 The American Society of Civil Engineers gives the estimate that $3.6 trillion needs to be spent before 2020. To give you a sense of scale the entire federal budget for 2015 was $3.8 trillion. So if we could just have one year where we suspend all Social Security payments, temporarily lay-off the entire military, avoid paying interest on any bonds and route all that money to infrastructure we’ll be okay. But if we don’t? Again this is the part that I’m unclear on, but maybe running some numbers will clear things up. I mentioned the federal budget, but, of course, much if not most of infrastructure spending takes place at the state and local level. If we add in their budgets we get a figure of somewhere in the $6.6 trillion dollar range for annual spending. So it’s not quite as bad, but if we take the $3.6 trillion recommended by the American Society of Civil Engineers in 2013 and divide it up over seven years (2014-2020) we get just slightly more than $500 billion per year. This is about 8% of all government spending for a given year, or to put it in different terms it’s about what the Federal Government spends on the military every year. So it’s a lot of money. The next step in the analysis would be to look at what we actually are spending. If we need to be spending $500, how big is the shortfall? As best I can tell we’re spending somewhat north of $400 billion once state and local spending are included. Which means we’re missing the American Society of Civil Engineers target by about $100 billion per year. Hmm… I started this section by wondering if running some numbers would clear things up, and I’m not sure that they have. I can see several different arguments. One might argue that a 20% shortfall is not that big of a deal, and our infrastructure is probably mostly fine. It should be mentioned, since I haven’t already that the American Society of Civil Engineers is not necessarily a neutral third party. They definitely have a stake infrastructure spending. In other words it’s not inconceivable that the $3.6 trillion I started with is inflated. On the other hand I can see making an argument that the $400 billion we are spending puts out all the short term fires and buys enough infrastructure to keep things from completely collapsing, but it’s the extra $100 billion which would help you get out in front of things. An example of this argument might be the LA freeway system, which by all accounts is constantly under construction and constantly expanding, but you never hear someone say that after this last bit of construction that everything moves smoothly. It’s a constant traffic jam and all the new construction ends up being just enough to keep the entire system from collapsing into a parking lot. At this point I’ve spent so long talking about how bad the infrastructure is that you’ve probably forgotten the original question: Are we any good at it? But if we accept that the US infrastructure is in bad shape, then the next, obvious question is what should be done about it, and if the answer is, as Trump, and all right thinking people agree, throw a lot of money at it, it’s useful to ask how effective that will be. Interestingly Obama was in a similar position when he was elected in 2008. Before he even entered office he had proposed an $800 billion stimulus package targeted at “shovel ready” projects. In other words, when Trump proposes a big round of infrastructure spending, it’s important to remember that we’ve already been in this position and it might be instructive to look at how it turned out the last time it was tried. After being elected Obama had no problem getting the stimulus package passed, and it was signed into law in February, shortly after his inauguration. Only after it was passed was it discovered that “shovel ready” was something of an exaggeration, a point that Obama himself admitted later in his first term. So the first lesson we should take from this is that just dumping a bunch of money into infrastructure and getting immediate results is harder than it looks. Another takeaway from the 2009 stimulus is how underwhelming it was. As I’ve said $800 billion was spent (and to be fair, if you look at the bill it was spread out all over the place) and yet what great infrastructure projects can we point to as a result of this $800 billion? In the past spending on infrastructure got us stuff like the Hoover Dam, the interstate highway system, the Erie Canal, the Three Gorges Dam (no, wait that’s China). But what did we get out of the 2009 stimulus? Or perhaps more appropriately what should we have expected to get? I mentioned the interstate highway system as an example of impressive infrastructure from the past. It had a total cost of $119 billion dollars. This was the finally tally in 1996, so I would assume that those are 1996 dollars (which would be $183 billion today) but it’s possible that since the interstate system took decades to build that those are not all 1996 dollars. Regardless it’s clear that the 2009 stimulus should have been able to build something equivalent to the interstate highway system perhaps several times over. Unless I’m overlooking something massive, I presume that it did not do that. I also mentioned the Hoover Dam, which cost $49 million at the time, and $700 million in today’s dollars. As I mentioned above the 2009 stimulus was spread out over a lot of different areas. But it was the equivalent of well over 1,000 Hoover Dams. I assume that as part of Obama’s stimulus we could have squeezed out at least one project of a similar scope, but yet, I’ve seen no evidence of anything which fits the bill. Again, I ask the question, are we any good at building infrastructure? I think the answer is we aren’t, though perhaps we used to be. Does this mean Trump’s proposals are doomed? Well perhaps not doomed, but I can guarantee that it’s going to be harder and have less eventual payoff than any of the proponents of the plan think. And here at last we tie this whole subject into the theme of the blog. Is it possible that it’s not just something wrong with infrastructure, but something wrong with us? Have we lost the ability do really impressive things? Is this evidence of a civilization in decline? For the answer to that I’ll turn to a concept I haven’t mentioned since my very first post: catabolic collapse. Lots of people imagine that there will be some dramatic event which will cause the complete collapse of civilization. Before the event, normality, after the event and in an instant, a cannibal wasteland where only your stockpile of guns and ammo stands between you and a giant stewpot. Other people imagine that things will go on pretty much as they are, only possibly better. My position is that neither of those is very likely, though both are possible. A full scale nuclear exchange could still result in the former, or, on the other hand, maybe we have reached the End of History and things are just going to get better from here on out. My position is that over the next several decades will experience something in between. As I said the term for this is catabolic collapse. It uses metabolism as an analogy. There are two types of metabolism, anabolic and catabolic. As something of an oversimplification, in an anabolic state you’re building reserves and muscles, in a catabolic state the reverse is happening, you’re spending your reserves and breaking down muscle mass to use it as energy. Applied to infrastructure the analogy is that when we’re in an anabolic state we’re building new infrastructure, but in a catabolic state we have to consume some infrastructure (or more accurately stop maintaining it) to support the critical infrastructure. Just as in a famine your body might consume muscle mass to keep your heart working. This is all straightforward enough, but how does a society go from an anabolic state to a catabolic state? Imagine that a society has a certain level of productivity. A large chunk of this productivity has to go into maintaining what we already have. It’s easy to see this process at work if you look at the federal budget. In any breakdown of the federal budget you’ll see a giant category labeled mandatory spending. This is money we’ve dedicated to fulfilling promises which have already been made, and to maintaining the status quo. Of course even when we look at the, somewhat inaccurately named, discretionary spending, there’s not a huge amount of wiggle room there either. No one’s just going to decide to one day eliminate the Navy. Which means that as far as new stuff goes we either have to go deeper into debt or raise taxes. Our resources do have a limit and the maintenance budget just keeps growing. Reduced to the level of infrastructure it’s very similar. We have a certain amount of resources to dedicate to infrastructure and a big chunk of that goes to maintaining what we already have and if there’s anything left over we can build new infrastructure. So far so good, but what if the resources available for infrastructure aren’t even sufficient to maintain what we already have? If that happens we enter a catabolic state. And unless the resource limitation is temporary we start down the road to catabolic collapse. One of the problems with detecting this and doing something about it is that it can sneak up on you. For example, just because you’re building new infrastructure doesn’t mean that catabolic collapse hasn’t started. As I already mentioned, new stuff can be built at the expense of maintaining the old stuff, until of course the old stuff breaks and then you’re faced with having to conduct costly repairs and find money for new stuff as well. It’s only when that pinch occurs that catabolic collapse really becomes apparent, and even then you can expect a lot of denial. Are we in catabolic collapse? Are the resources available for infrastructure less than the cost of maintaining what we already have? For the answer to that question it’s important to know what we mean by maintenance. And for this I’d like to turn to the story I started with. The story of the Anderson Memorial Bridge. That bridge repair has taken so long and been so costly in large part due to our expanded definition of maintenance, an expanded definition that brings on expanded costs. This expanded definition includes ordering special bricks to preserve the historical character of the bridge, additional permits, the bureaucracy, safety requirements, etc. etc. All of which didn’t exist when the bridge was first built in 1912. And the trend is to add even more “maintenance” of this type in the years to come. Is all this indicative of a robust and growing nation or more indicative of a nation whose best days are behind it? In other words, when all is said and done we’d all like to put on more muscle, but when you’re old and tired sometimes it’s just easier to sit in your recliner and yell at the TV. The Change Hurricane: Are we Polish Jews in 1937 or East German’s in 1988? Every so often in history everything changes, and people can find themselves in situations which seemed unthinkable just a few years or even a few months beforehand. Examples of this include the Sack of Baghdad (which I’ve already talked about), Poland during World War II, the Taiping Rebellion, the fall of the Aztecs and of course the recent Syrian Civil War. In all of these cases there was definitely a certain degree of surprise attached, which is not to say that these catastrophes came out of nowhere, or even that no one could have predicted them, just that they generally happened more quickly than expected and when they did happen the consequences were much worse than generally anticipated. As we look back at these catastrophes they are all strong arguments in favor of preparing for the worst. Of course preparing for the worst is costly, but these are all situations where even large costs would have been worth it if you could be sure of avoiding the one big catastrophe. As just one example if you were a Jew in Poland in 1937, however inconvenient it might have been to take your family to America, it would have been way better than any outcome which involved staying in Poland. Yes you may not have spoken the language. Yes immigration would have been costly and difficult. Yes, you may have left friends and family and your home, but anything is better than what did happen. Some people will argue that while all of this is obvious in hindsight, could you really expect the Polish Jews to realize all of that was coming in 1937? And this is an excellent point. To put it in more recent terms, no one imagined in January of 2011 that the Syrian Civil War would still be going on in November of 2016, that Assad would still be in power (and likely to remain in power) and that 400,000 people would have died. But in the same vein of things being clear only in hindsight, once things have happened it’s too late to do anything about them. Obviously the ideal solution is to see things before they happen, but that’s impossible. Or is it? It is impossible to be sure about anything that hasn’t happened. Our hypothetical Jew could have fled Poland in 1937 only to have Hitler assassinated in November of 1939 by Johann Georg Elser, perhaps leading to a situation where death camps never happened. In other words it could have very easily ended up being a bad idea to make huge sacrifices in order to flee Poland. To use an actual example you could have crafted a daring plan to escape from East Berlin to West Berlin in May of 1989, risking death, when all you had to do was wait six months. This is the question we’re faced with. Are we Polish Jews in 1937 or East Germans in 1988? And that’s nearly impossible to know, but this doesn’t mean that you shouldn’t pay attention to which way the wind is blowing and whether it’s a gentle breeze or hurricane force winds. Lately it appears that it might be the latter and that it might be blowing in the wrong direction. 1- NATO could be disintegrating: First there’s the election of Trump, but on top of that we have the top two candidates in the upcoming French Election both favoring closer ties to Russia, with even the establishment candidate saying “Russia poses no threat to the west.” As I have argued in the past Russia views NATO expansion as a major threat and a major betrayal, there’s no easier way to get on their good side than pulling back from that expansion and no quicker way to get on their bad side than seeking to continue NATO expansion. 2- Italy might be on the verge of collapse. You may or may not have heard about the huge vote recently in Italy, regarding some constitutional reforms. The leader of Italy, Matteo Renzi, said that the reforms were necessary to bring stability to Italy and he consequently resigned when they were not passed. Having a change of governments in Italy is nothing newsworthy, but Italy is in a serious financial crisis and Italian bonds represent the third largest bond market in the world. Italy may be facing a financial Armageddon regardless of what happens. 3- Turkey is getting progressively more autocratic. Turkey is still a democracy, and they still hold elections (also there’s the occasional coup) but those elections are becoming increasingly pointless. Recep Erdogan has a pretty good chokehold on things and it’s unlikely to change anytime soon. Also as Turkey becomes more autocratic, the ideological split between them and Europe widens. As an example the EU Parliament recently voted to end talks on Turkey’s membership in the EU. Turkey is still part of NATO, but on that issue I refer you back to point number 1. 4- The Middle East and North Africa are still a mess. We’ve already talked about the Syrian Civil War, and of course there’s ISIS. The good news is that ISIS appears to be near defeat, the bad news is that no one knows what happens once the various players in the region no longer have a common enemy. Also, like most people you may have forgotten about Libya, or if you haven’t you may have heard that a peace deal was signed. Well whatever the effects of that deal there’s still a vast civil war taking place, with Obama saying that not being prepared for a post Gaddafi Libya was the biggest mistake of his presidency. 5- Venezuela is suffering from hyperinflation and economic collapse. Of course the economic problems are the result of a huge power struggle between President Nicolás Maduro and his opponents, but just because there’s an explanation doesn’t mean that there’s an easy to fix. And as a side effect of this Venezuela has the highest per capita murder rate in the world. The end of NATO would mean the end of American hegemony. It has to end eventually, and better it end with a whimper than a bang, but the world that comes after it ends could be very different. Events in Italy could mean the end of the EU, which is already looking shaky after Brexit. Also we’ve see how financial contagion spreads. The failure of Italian banks or bonds could mean another global financial crisis. Turkey is the traditional foe of Russia. If both are resurgent and NATO goes away, do hostilities start again? How soon before Turkey and Erdogen decide that they need nukes? The Middle East and North Africa have never been poster childs for stability, but now the chaos is beginning to spread. Refugees from these two areas are one of the major driving factors behind the EU crisis and a contributing factor to what’s happening in Italy. Syria seems bad enough already but it could get worse. Venezuela is on it’s way to becoming a failed state. Does having a failed state to our south look the same as Europe having failed states to the south of them? It seems like, best case scenario, we end up in a situation similar to Argentina under Pinochet, and as someone who spent the latter half of the 80’s in high school debate, I can vouch for how much hand-wringing he caused. But perhaps you remain unconvinced. So I will turn to something which does involve potential global catastrophe, nukes, war, China and shamans… I’m speaking of course about North and South Korea. We all know that North Korea has nukes, but since the death of Kim Jong Il in 2011, the rate of advancement North Korea has shown both with nuclear weapons and missiles, has been, well, impressive. Just this year they’ve done two nuclear tests and 21 missile tests. There has always been an appalling lack of any concrete options with respect to North Korea, but as their technology gets better all the former bad options just keep getting worse. When North Korea had just one nuke they mostly used it for leverage to acquire food aid, and as one more deterrent against invasion. Now that they have several nukes and increasingly advanced delivery systems what will they do? I think people kind of assume that things would continue as before, there would be a lot of bluster. Minor cross border incidents involving fatalities, a general despair, but nothing big would happen. But increasingly the winds of change in that region appear to be blowing more strongly. A sense of urgency is growing, and a consensus developing that North Korea is planning to use its weapons to dictate events on the peninsula. Perhaps demanding that the Americans leave. I’ve talked before, at some length, about how nukes are qualitatively different than any previous weapon. And this illustrates the point. Imagine that North Korea got to the point where they could hit the west coast with an nuke. (Some estimates put this at only five years away.) And they threaten to nuke San Francisco unless we remove all our forces from the Korean Peninsula. What are our options? We might hope that China would cut off trade, but it’s not like the North Koreans aren’t used to sanctions and hardship. In other words I’m sure there would be all sorts of diplomatic reactions, but there’s a good chance they wouldn’t work. So we’re looking at the threat of a nuke hitting San Francisco, and we’re out of diplomatic options. Now what? Obviously it would be great if we could shoot the missile down, but as I mentioned in the previous episode on nukes, that’s actually difficult. A lot would depend on whether we had the right ships in place to shoot the missile down when it was launched. But let’s say, optimistically, that we have an 80% chance of shooting it down. Are we willing refuse their demands and accept a 20% chance of SF getting nuked? If we’re not willing to do that (and I suspect we wouldn’t be) what other options do we have? We could, of course, always invade, but that just changes the SF missile from a possibility to a certainty. And adds enormous war deaths on top of it. In addition to the increased external tension between South and North Korea. South Korea is dealing with a major political crisis of its own. It’s current president Park Geun-hye has an approval rating among 19-39 year olds of 0%. Yes, you read that right, the number of people under 40 who like her is statistically undetectable. This is where the shamans come in. The reason for her unpopularity is that she has engaged in frequent consultation with an old friend who is the leader of a shamanistic cult. (In a fashion similar to Nancy Reagan.) Just the consultation might be a storm that could be weathered, but the president also funneled money to her friend. Does the weakness and unpopularity of the South Korean president make the North Korean situation worse? That’s hard to say for sure, but it certainly doesn’t make it any better. And it seems safe to assume that for people living in South Korea things must seem pretty chaotic. Thus just like the Polish Jew in 1937 and the East German in 1988. The South Korean of 2016 is faced with a choice. They can do nothing and take their chances. Or they can spend time and money trying to mitigate the downsides of various potential catastrophes. In the latter case they’re still taking their chances they’re just trying to lower the odds of something truly bad happening. It’s always possible that the North Korean government will collapse (though this isn’t necessarily great for South Korea either) or that some other, positive black swan will emerge, and the 2016 South Korean will be in the situation of the 1988 East German. But it’s also possible that the 2016 South Korean will be much closer in circumstances to the 1937 Polish Jew. As I said you can’t know for sure. And it’s always a balancing act between the admittedly high probability that things will be okay which makes preparing for the worst just wasted time and money, or, on the other hand, the small possibility that things will be awful, and you’ll be grateful for every bit of preparation and upset that you didn’t do more. One of the reasons I’m recording this episode and indeed one of the reasons for having this podcast in general is that people have a tendency to underestimate the chances of something bad happening. So if you’re on the fence about which course to choose I think you should choose to be prepared. But perhaps even more important I think you need to be aware of the political weather. If you’re a 1937 Polish Jew and you’re not paying attention to Hitler then of course you’re going to make the wrong choice. On the other hand for those East Germans preparing to escape in 1988 Gorbachev had been in power since 1985, so for them the wind was blowing the opposite direction and they just had to wait. The title of the episode is The Change Hurricane, and thus far all I’ve talked about is some local storms which, while scary, and possibly globally significant (I can only imagine what would happen if North Korea nuked San Francisco) are still fairly local. If we’re talking about hurricane’s one would expect something bigger than just a spat between the two Koreas which has been going on since 1948. I am of the opinion that things are bigger than just the isolated incidents I mentioned above, but this is also where things get more speculative. Also it’s time for another list. 1- Declining American Power: We’ve already talked about the end of the American hegemony and as I mentioned it has to end eventually, and when it does I doubt we’re going to transition to another unipolar world, or even a bipolar world. I think there will be lots of countries trying to fill the gap. Certainly China and Russia, but also Turkey, Iran, India and Brazil are all going to want a piece of the pie. And that could play out in interesting and potentially violent ways. 2- Nuclear proliferation: Closely related to the last point. There are a lot of countries who could currently make a nuclear weapon, but have chosen not to because they consider themselves to be under the US nuclear umbrella. Turkey and Japan would certainly fall into this category. Does a declining America and a belligerent Russia and China set off a new round of proliferation? If it does the chances of weapons being used goes way up. 3- Immigration: This is a hot button issue with lots of emotion on both sides, and by classifying it as a negative trend you may feel that I’m already choosing a side, and perhaps I am, But in a sense this is a secondary effect. If things get worse because of wars or famine or global warming, then the number of people willing to risk nearly anything to get to a better country (similar to our 1937 Polish Jew) is going to go way up. And insofar as I am taking a side I think that there is a limit to the rate at which immigrants can be assimilated, and when this limit is exceeded, things can start changing in unexpected ways, as we’re seeing in Europe. 4- Debt: The modern, developed nation state, is able to accumulate debt in amounts never before imagined. I see that as a huge source of fragility. Perhaps it is or perhaps it isn’t, but we could be getting an example of how bad it can be if Italy runs into problems with its bonds. One early indication that makes me worry about Trump is it looks like he might explode the deficit. 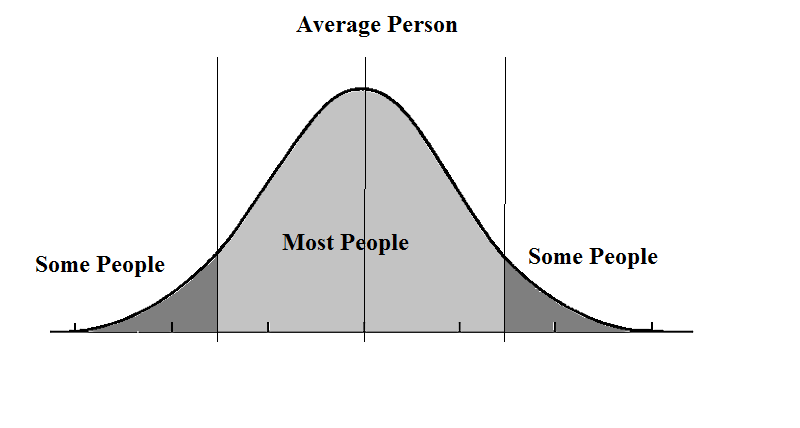 5- Social Unrest: I think by historical standards the level of social unrest is still pretty low. But, as a consequence our tolerance for it is not that high either. What happens if Trump is as bad as his worst critics fear, and we have riots every night in most major cities? I can’t even begin to predict what that looks like, but I think, at a minimum, It’s safe to say that the anti-cop/pro-cop division would become much more pronounced. 6- Environmental concerns: I already mentioned this to a certain extent under immigration, but for many people the trend that worries them the most is global warming. One of the chief arguments is that this makes things worse in places where it’s already pretty bad, like Sub-Saharan Africa. But also if the sea level rises by six meters that’s not good either. I think this is more slow moving than the rest, but it could also be the hardest to do anything about. This entire episode could be written off as nothing more than fear-mongering. We’re probably not the 1937 Polish Jews and I assume most of my readers aren’t even 2016 South Koreans. We could in fact all be like the 1988 East Germans and we’re only a short time away from the dawning of a new age where we never have to worry about another Hitler, or Nuclear Proliferation or Global Warming, and any preparation you do now is just a waste of time. As they say, anything is possible, but that particular scenario seems unlikely, and not just because we’ve completely neglected to mention things like natural disasters. At least with Korea and Syria we have some control. In other words.Bad things happen, and most people are surprised by them. But you don’t have to be. If you see which way the wind is blowing you can take steps to lower your risk. And it’s possible that those steps will be a waste of time and money, but it’s also possible that in 2019 when President Trump defaults on the debt, and panic grips the world, that you’ll be glad you spent some time preparing for the worst.